*Edited on 4/11/2018, Instructions for Instant Pot and Slow Cooker included. This recipe isn’t really ‘Mexican’ but it does have some Mexican flavors and it’s definitely a family favorite. 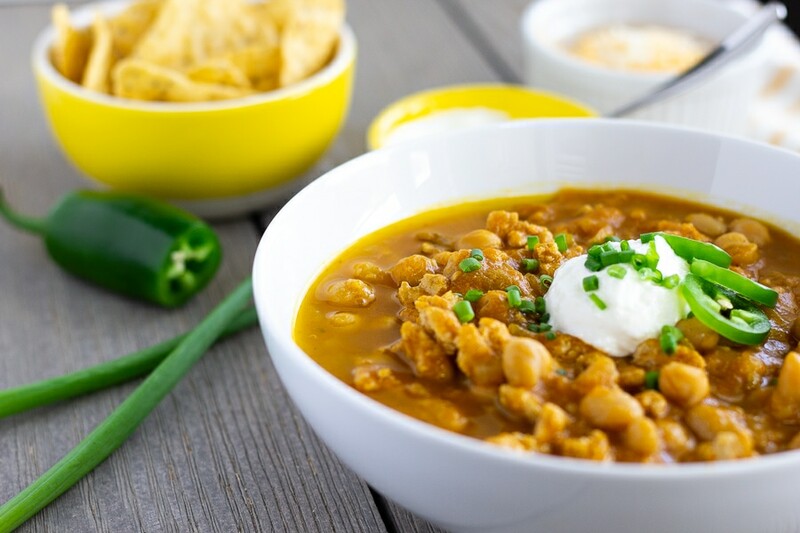 Turkey pumpkin chili is one of those dishes that I have on rotation and fall back on when I can’t think of what to make for dinner. It’s made in the slow cooker, so there’s little prep time involved, and it’s the perfect dinner for a cold night. The recipe is from Skinny Taste’s new cookbook, Skinnytaste Fast and Slow. I love this book since all the recipes can be made either in the slow cooker or 30 minute quick and healthy meals. Now that I’ve made it several times in the Instant Pot, I actually prefer this method. It’s faster, 25 minutes, and it has more flavor locked in. The best part is that you don’t have to dirty a separate saute pan to brown the ground turkey. Instead you can saute it right in the Instant Pot and mix everything else in the same pot to cook. I’m all for less dirty dishes! 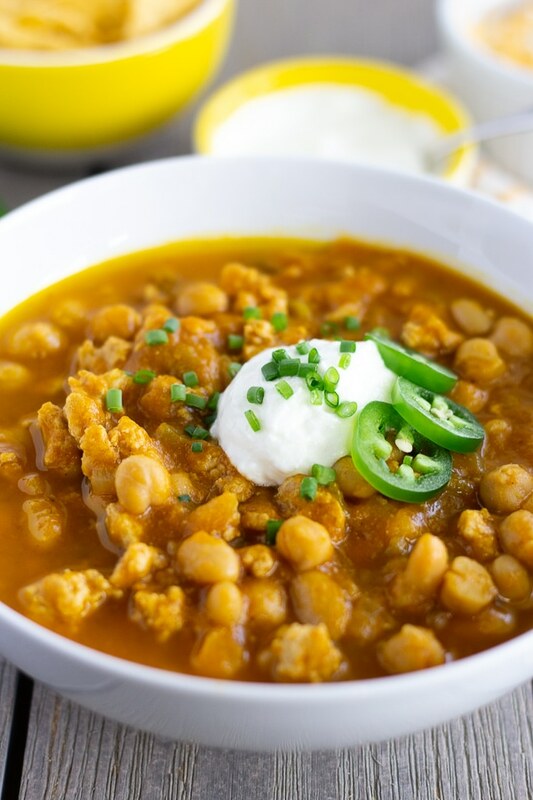 At first I was a little hesitant to try a chili with pumpkin puree, but it really adds a nice flavor and thickness to the chili. Not to mention, I love pumpkin anything in the fall/winter. The original recipe uses ground turkey breast. However, I prefer ground turkey which is a mixture of dark and white meat. I also add chickpeas to make the chili a little heartier. I’ve even had it with canned corn and that taste great too. 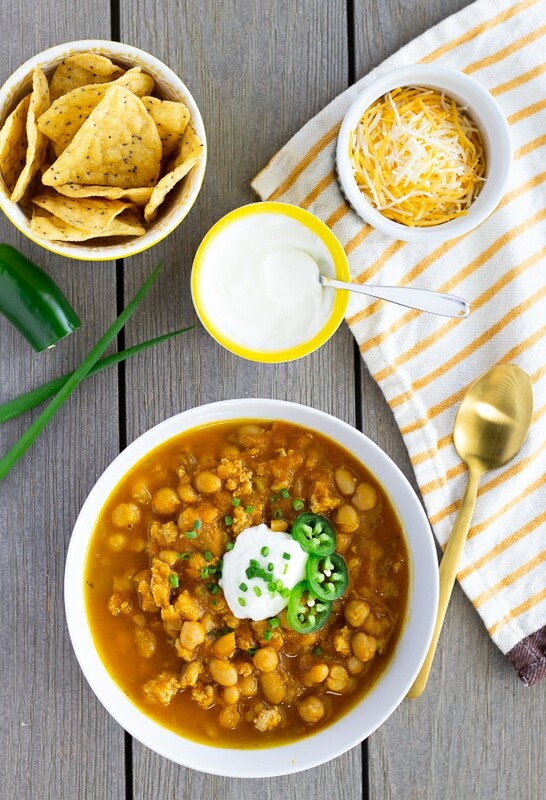 The kids love this chili and the spice level can be adjusted to suite your family’s taste. We like the chili topped with shredded cheese, a dollop of Greek Yogurt, chopped chives or cilantro, and chips or cornbread for dipping. 2 lb Ground Turkey, I've also made with 1 lb and it's still a filling meal. Shredded Cheese, Greek yogurt, or Sour Cream, Chopped Cilantro, or Chives. Chips or Cornbread make great additions too. Press Saute function on Instant Pot, add oil, onions, and garlic. Saute till soft and remove. Leave on Saute function, add ground turkey and brown, breaking it up until fully cooked. Add onions and garlic back to the pot, along with beans, pumpkin puree, green chiles, chicken broth, chili powder, cumin, oregano, cinnamon, salt, pepper, and bay leaves. Close lid, and place valve to Sealing. Set timer to 25 min, high pressure. Once timer goes off, do a quick release. Remove lid, take out bay leaves, stir chili and taste for more seasoning. Add onions, garlic, and sauté until onions become soft. Add to crock pot. Add turkey and brown, breaking it up until fully cooked. Add to crock pot. Add beans, pumpkin puree, green chiles, chicken broth, chili powder, cumin, oregano, cinnamon, salt, pepper, and bay leaves. Cover and cook on high for 4 hours or low for 8 hours. Remove bay leaves and add more salt or pepper if needed. Looks wonderful. Congrats on your 2 year anniversary!